Thanks for meeting me here over the years and letting me know what you thought. See you in the hills. Kathleen Purvis' story last Wednesday on five essential kitchen tools ("5 tools, 5 books, 5 do's and 5 don'ts for new cooks setting up their first real workspace" is a model of what we've come to expect from her writings on food over the years. It's always good, always helpful, always to the point. And it reminded me how much we depend on favorite kitchen tools, every bit as much as woodworkers depend upon their favorite woodworking tools. And how much I hated it when a house fire burned up a tool bag with one of my favorite ratcheting screwdrivers. It had a spherical plastic handle about the size of a tennis ball with square holes on each side, into which a four-inch rod with a choice of Phillips or straight slot screwdriver tips could be inserted; depending on which side the rod was inserted in, the gizmo would drive screws or remove them. It was cheap, easy to use and with the large round handle, fast. I was sorry to find they're no longer made, or at least no longer available in stores where I've looked and websites I've tried to Google. And so it goes with the venerable Mouli Grater, one of my favorite kitchen tools. Sad to say it's no longer made, but you can find them on E-bay and at flea markets in many places. A French company now called Moulinex once made them and we wore out a couple of them making the world's best pimento cheese for family and friends. It was a simple tool made of lightweight tin -- sort of a tong with a cylindrical rotary grater turned by a little crank on one end. We used it mostly to grate sharp cheddar cheese into the thinnest of shreds, which is essential in getting the cheese to meld properly with the Chinese hot sauce, mayonnaise, pickle relish and red and green peppers my wife puts into the cheese. My job is to grate the cheese; hers is to work her wonders on the blend until it's ready to try out with a handful of wheat crackers. More hot sauce? A few more spoonfuls of relish? I doubt that she ever made it exactly the same way as all the other times, but our friends have come to expect a tub of it when they visit. I took at tub with me last week on an annual college-pal fishing trip. I had barely walked into the house on Beaufort's front street before one of my buddies looked up and asked, "Where's Martha's pimento cheese?" So it's a shame they're no longer made like they once were. I've read that the availability of electronic gadgets crowded the Mouli out of the market. Some folks didn't like the way the tin would discolor; stainless steel looks better and sells better, I guess. I know, I know: There are a lot of rotary graters on the market, and we've tried a handful of them. 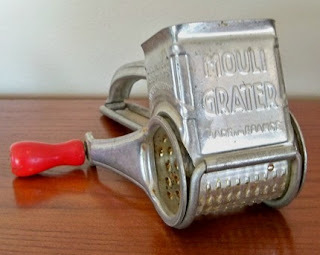 But none compares with the Mouli Grater for ease of use and quality of the cut. We've been nursing our last one along for years, and soon we'll probably be hunting for another one at a flea market somewhere. If you see one before I do, my advice is grab it and hoard it. A federal court has denied a request from Alcoa Power Generating Inc. to rule that the state of North Carolina had effectively waived its authority over a permit Alcoa needs to renew its federal license to generate electricity at dams it owns on the Yadkin River. It's another setback for Alcoa, which until a couple of years ago appeared to be on the verge of getting a new license to operate the hydroelectric plants. Curiously to those not familiar with the complicated proceedings, the Department of Environment and Natural Resources had appeared to support issuing something called a 401 certification, which Alcoa must have to get its federal license renewed. But last year the state withdrew its permit after concluding, based on some emails made public in an administrative law proceeding, that Alcoa had withheld important information from the state about water guality in the river. Alcoa quickly announced it would fight the permit revocation and petitioned the U.S. court of Appeals for the D.C. Circuit. Alcoa wanted the Federal Energy Regulatory Commission to go ahead and grant the license. The appeals court rejected Alcoa's argument and said FERC cannot issue the license pending completion of litigation over the permit. The executive director of a non partisan, non profit organization devoted to expanding education about statewide elections raises a good question about what's going on in the legislature. In a column about an apparent "war on voting" in the legislature based on bills that would make it harder to vote by requiring photo ID cards and reducing the opportunity for early voting, Damon Circosta notes that it's not unusual for the majority party to try to lock in its electoral gains in various ways. The Democrats nearly perfected that process during the century-plus that they ran the legislature, except for a couple of sessions when Republicans ran the House. But, Circosta argues, voters elected the new Republican majority in hopes they wouldn't do the same things Democrats did. As he put it, "But lost in all of this partisan warfare is the notion that we did not elect this new crop of leadership to act like those who came before them. We elected them precisely because they told us that they would be different." Because it isn't, the likely result is "voter discontent" and less involvement in politics. RALEIGH - Perhaps the most overused rhetorical ploy is when politicians declare a "war" on something. Formal declarations of real war -- the kind with tanks, missiles and opposing nations -- are thankfully exceedingly rare. But lawmakers often declare war to attract attention to their cause. Think Lyndon Johnson¹s "war on poverty" or Richard Nixon's "war on drugs." When a problem is so insidious that it merits a declaration of war, people take notice. Given some of the recent bills proposed in the N.C. General Assembly, there seems to be a "war on voting." So far this session we have seen proposals that would eliminate a popular program allowing people to register to vote during early voting; decrease the days and times early voting is accessible; limit the verification methods used on Election Day to only certain types of photo identification; and require ballot instructions to be in English only. As if that wasn't enough, the war on voting also includes a steep reduction in funding to our State Board of Elections and the end to programs that reduce corporate, union and other special-interest influence in elections. I doubt we will see any lawmaker hold a press conference explaining why there are so many bills aimed at making it harder to vote while also making it easier for special-interest dollars to find their way into our political system. It's much more popular to declare wars on societal ills like poverty and drugs than to declare war on civic participation and voting. Telling people that you prefer they don't participate in democracy won't win you a lot of friends. But make no mistake. If these proposals find their way into law, people will have a more difficult time getting involved with elections, and those who wish to use big money to tilt things in their favor will have a much easier time. On some level, we should expect to see a slew of election-related legislation. In 2010, for the first time in over a century, we saw control of both chambers of the General Assembly switch political parties. When that happens there is a natural inclination by the new crowd to lock in their electoral gains by making it more difficult for voters who they think may not agree with them. Democrats, when they were in charge, were not immune to such shenanigans and Republicans appear to be operating from the same playbook. But lost in all of this partisan warfare is the notion that we did not elect this new crop of leadership to act like those who came before them. We elected them precisely because they told us that they would be different. Over the last decade we have seen a sharp increase in voter frustration. Part of this frustration certainly stems from disenchantment with how our elected officials comport themselves when they are tasked with setting up the rules for elections. By trying to shape election law for short-term partisan gain, our politicians fuel voter discontent. Fewer and fewer of us feel inclined to participate in a process we see as tainted. And when only a handful of us get involved with politics, then our representative democracy doesn¹t really represent us at all. No lawmaker would be so foolish as to come out and openly declare a war on voting, but it would be refreshingly honest to at least hear our elected officials say that they are in fact making these changes for their own electoral gain. At least then we citizens would be on notice that our democracy is under assault.